Our family really enjoys biking together. Several years ago, we got a regular bike trailer and it has served us VERY well! We have gotten so much use out of it...so many miles! Last year, when we grew to a family of 6 we needed something else, so we bought a second trailer off Craigslist and we each pulled a trailer with 2 kids. The girls have outgrown the trailer though, so for the last year or so we have been talking about what to do. They are too big for the trailer, but don't have enough endurance to ride their own bikes very far. Not to mention they are still on training wheels, and we have hills in every direction getting to our house so it's not a super easy ride. We toyed with the idea of getting at least 1 tag along, but even that I'm not sure how long they could really ride comfortably on at ages 4 and 5. I also have bad memories of a tag along from one summer when I was nannying. It was SO hard to balance with that thing on the back. I felt like every time the kid moved a little bit the whole thing swayed! So we have really not known what to do and weren't sure if we should just push cycling to the backseat for a few years until the girls are at the phase where they can ride a few miles on their own bikes. We didn't really want to do that, but didn't know what other options we had! Then a few months ago, a girl I went to high school with posted a picture of her and her daughter riding and she had this insanely cool looking seat for her daughter to ride in. I showed my husband and we were both like "WE HAVE TO HAVE IT!" So we started researching, but holy cow...they ain't cheap. We were back and forth on it for awhile but finally figured out a way to make it significantly less by using a couple gift cards, points from our vacation, and a sale on Amazon! Score! We got them last week and then it rained all weekend so we couldn't ride...boo! My husband took each of the girls just down the street during a break from the rain and they were obsessed. Wednesday we went on our first ride! We went down to a park about 5 miles round trip. It was so much fun! The WeeHoo's are awesome because the girls are actually pedaling and helping to propel, like a tag along, but they are strapped into a seat. I feel like it's way safer and it is definitely way more comfortable for them! They have little handles they can hold on to, and pockets on the side for snacks and a drink, which they love, of course. My only complaint is that my younger daughter's feet come out of the straps a lot and I'm not sure what I can do about it. It's not terrible, she can keep her feet on the pedals without them, but we stopped several times to put them back in. Oh well, minor annoyance. Otherwise we are madly in love so far! My husband actually pulls quite the train. His bike is followed up by my oldest on her WeeHoo, and then a trailer with both of the littles. Last night, we were discussing what to do for the evening and it was another beautiful night, so we decided to get a little crazy and go to the public library. It's not terribly far, about 7 miles round trip, but since we had just ridden for the first time the night before we were both sore, and our endurance isn't super high right now coming out of winter. Well, I guess I should speak for myself. It wasn't terrible though and it was so much fun. The kids all did so great. It took us about a half hour each way with some wind, but I'm hoping we can up that a little bit. We are planning to do a lot of biking for the next several months! 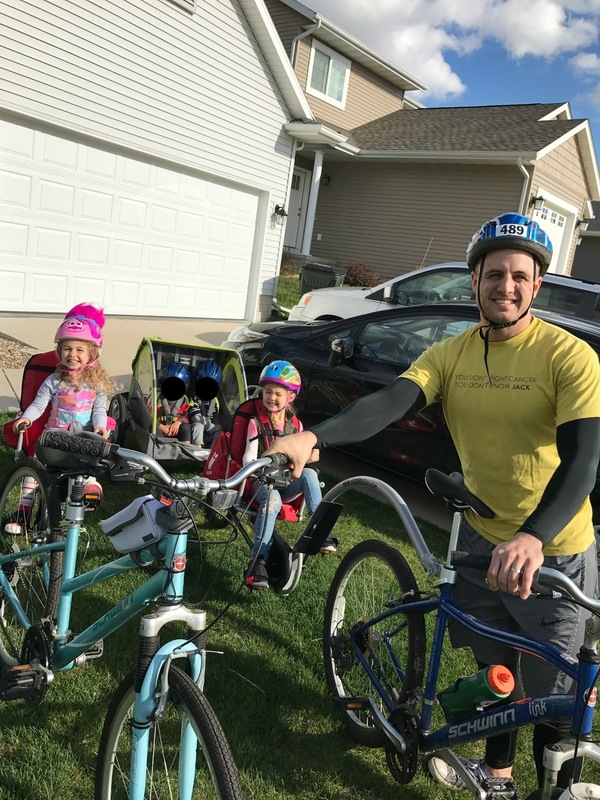 Our amazing library, the girls music class, and their swim lessons are all in the same vicinity which is about 7-9 miles round trip for each of those, so we are planning to do a lot of bike commuting to those things in the evenings. 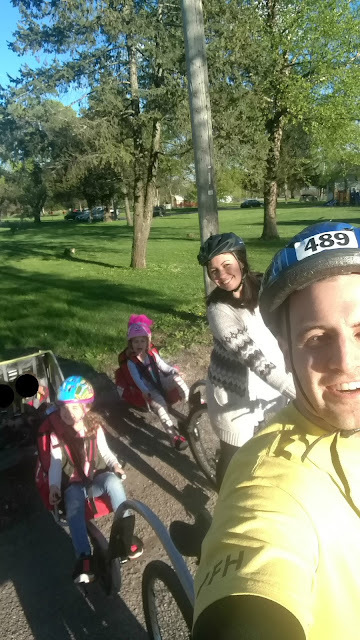 I wasn't 100% sure how the littles would do, because last year they didn't tolerate the trailer very well and it was, well, a bit of a disaster and we didn't bike much. But they have done awesome so far! I thought we'd have to do a lot of short rides for them to get used to just sitting in there, but there was only a little bit of whining which was them fighting over a snack on the way home... #toddlers. I had to blog about this in case anyone else needs a WeeHoo....seriously they are incredible and worth every penny!! I am so glad we found these, and the weight limit is 80 or 90 pounds so we should get several more years of use out of them!! !